If there’s ever a time built for comfort food, it’s the holidays, so I decided to take a crack at baking real-deal choc chip cookies for my partner Sarah’s family, who we were visiting up at the Newcastle Coast. But I wanted to do one better than my mother’s version (sorry, Mom) and aim to reach the upper echelons of those professional cookie bakeries. To help me in my quest, I turned to the New York Times, from which I remembered David Leite writing a terrific article about how to bake the perfect chocolate chip cookie. Leite goes back to the original recipe by Ruth Graves Wakefield, who introduced chocolate chip cookies to the world in the 1930s at her Toll House Inn in Massachusetts. Leite also points out a key step in Wakefield’s baking process that has been left out from those Nestle chip packages: refrigeration. It turns out that putting the cookie dough in the fridge for at least 24 hours, and up to three days, allow the eggs to be fully absorbed into the dry ingredients and develops a deeper complexity of flavour. Who knew? After I read the article in 2008, I hadn’t remembered that the accompanying recipe had come from Jacques Torres, probably since I had no idea what that meant until I visited the chocolatier’s factory in Manhattan’s Tribeca this past summer. Here you’ll find some of the city’s best hot chocolate, terrific artisan bars and bon bons, and, of course, a very good chocolate chip cookie. Even better was the fact that Leite had modified the Jaques Torres recipe to integrate other learnings he had picked up while researching his article. Things were looking good for my cookie quest. Cooking the recipe from Australia presented some minor challenges, from converting American weights, measurements, sticks of butter and temperature, to sourcing less-ready ingredients like cake flour and semisweet chocolate, but the nitty gritty gets a bit, well, clinical, so I’ve left that to the bottom if you really want to know the ins and outs. With all of the ingredients and conversions sorted, it was time to get baking. The day before, I had carefully mixed all of the ingredients, using a hand mixer in lieu of a KitchenAid (hint, hint, for anyone who desperately wants to buy me a birthday/Chanukah/holiday present). I did this all at Sarah’s sister’s house, all while here two-year-old twin girls and four-year-old nephew watched in near-shaking anticipation, literally climbing the walls from their stools on the opposite side. Grudgingly, I had to hand over my beaters to placate the hungry little savages, then turned my attention to the emptied bowl, where I scrounged up tastes of the remaining batter. Isn’t this always the best part of making cookies? The next day, I pre-heated the oven to 185-degrees Celsius, and removed the batter from the fridge. I was much drier than I expected, and it took a bit of finger muscle to extract batter and its cumbersome large chocolate discs, then form it into golf-ball-sized spheres. I spread them out on baking-paper lined pans, put them in the oven, and watched them work their magic… and then realised within minutes that I hadn’t spaced them out nearly far enough apart. About 15 minutes later they came out light golden, gooey, delicious – and slightly oblong. I did eight batches in total, and each time made adjustments to spacing, heating method (turning off the convection fan after the first two batches, as I’d been told that works better for baking) and time. If there’s one thing you have to do with cookies, it’s watch them – or time them perfectly. There’s a very fine line between beautifully golden and overcooked brown (read: dry) cookies. The end result? Chocolate chip cookies exactly the way I remembered them, maybe even better (at least the ones I didn’t overcook). And there’s still room for improvement and experimentation. Next time, I want to see what three days in the fridge does to the dough’s flavour, how using cake flour changes the texture, and what semisweet or dark chocolate adds to the taste. For now, though, I’ve got a dozen extra cookies tempting me from their Tupperware container, and I’m doing everything I can to avoid ruining my appetite. Again. 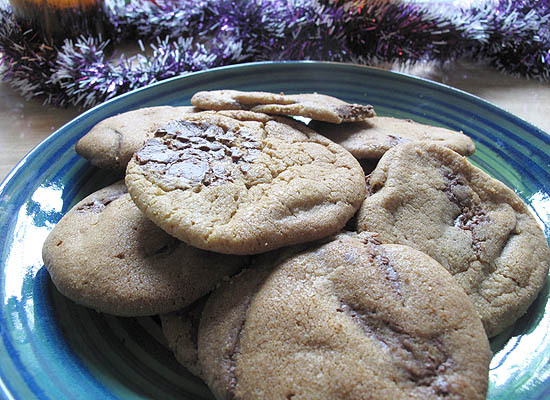 If you’re interested in the trials and tribulations of baking a US cookie recipe, this part is for you. The first challenge was the usual conversions, from pounds and ounces into grams – luckily my baking scale could switch between the two, so I didn’t have to make the conversion. Then there was figuring out what three sticks of butter consisted of in grams. A little Google research showed that one US stick of butter is 113 grams. The average Australian block of butter is 250g, so three sticks meant 1.5 blocks, with a little bit off the top (pedantic baking types can go back to the scales to be precise). The harder part was achieving the mix of bread flour and cake flour. Bread flour, which has more protein in it (11-12 percent, rather than 10 for standard plain flour), was pretty easy to find at Coles. Cake flour, however, was a different story. I searched several specialty shops to no avail. A little more Google research and I learned that cake flour is finely ground and lower in gluten than plain flour, and if it isn’t available, Women’s Weekly suggests the best substitute is to use plain flour, but remove two tablespoons for each cup that you use – which is what I did. 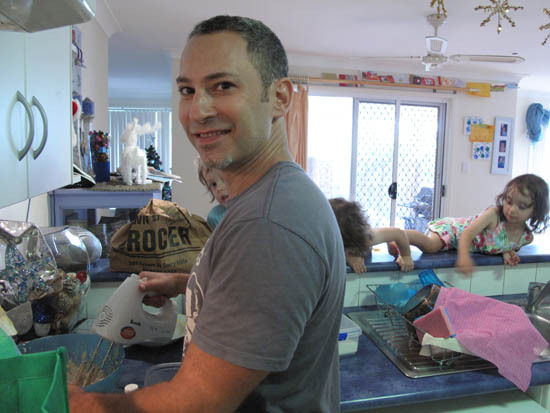 In hindsight, I later discovered that Fremantle’s Anchor Foods – whose Lighthouse bread flour I used (found at Coles) – also produces a cake flour. For the couveture chocolate, I head already bought a 1.5kg bag of Callebaut milk chocolate discs to make homemade rocky road, so I used them. I bought the bag at Chef’s Warehouse in Surry Hills for just $17, an even bigger bargain when I saw a measly 100g of Callebaut chips for sale in Edgecliff Mall for $9. Just think: it would cost $135 to get the equivalent amount. I’m no bargain hunter, but for once I was glad I had shopped wisely. Even so, my preference would have been for semisweet (or bittersweet) chocolate, but finding it in larger discs or chunks is difficult in Australia. If you’ve seen a good semisweet chocolate in Sydney let me know (note: the term simply means a minimum of 35 percent of chocolate liquor, so variations are extensive and as such, taste varies widely). I’ll also have a go at experimenting with dark chocolate next time. I’ve had the distinct pleasure of hitting a number of xiao long bao (XLB) establishments, from Melbourne’s HuTong Dumpling Bar to Manhattan’s Joe’s Shanghai. And finally, after today, I can add the well-trodden Din Tai Fung in Sydney to the list. It was an impromptu decision, following a much-needed yoga session in the city that conjured up the necessary soup dumplings cravings. I didn’t care that I was wearing running shorts and a sweat T-shirt on a trendy Thursday night; I wanted my XLB fix, dammit, and I was going to have it even if the fashion police got in the way. Even with the hype subsiding to managing levels, Din Tai Fung is still pulling in the crowds. I wasn’t up to speed on the system, so I wandered wide-eyed through the throngs of people standing outside the restaurant, and upon approach was urgently ushered by the hostess to come forward, quickly state my dining status (solo) and then had an ordering sheet pressed into my hand. I then scavenged for a pen and went with the assumption that I had to order from the listing, despite a lack of posted prices. The benefit of eating by yourself is that while the masses are waiting for their tables, you get escorted inside in minutes. Even so, the line seemed to be moving quickly, something I really appreciate after the experience of being stuck in New York’s Chinatown for 1.5 hours while waiting to get into Joe’s Shanghai. Mind you, it did give me time to squeeze in a decent haircut in an alleyway for just $6 bucks. At Din Tai Fung I bee-lined for the XLB, ordering the larger option of eight pork-filled soup dumplings, plus a pork bun to fill in the gap in my appetite. 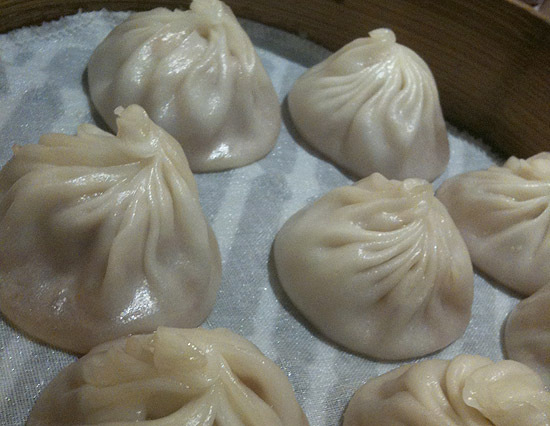 And as soon as they arrived, the comparisons with HuTong’s XLB began (and I had already ruled out Joe’s Shanghai’s version, as the overly thick skins made them inferior to our Australian contenders). The first noticeable difference was size, with DTF’s dumplings being smaller than HuTong’s, but both provided good eating experiences and could be picked up – very carefully – with chopsticks. So far, it was a 1-1 draw. Then came the thickness of the skins. Again, both dumpling houses produce beautifully tender and thin skins that just manage to hold together (mostly, but I take the blame for any clumsy breakages) while the bags are nimbly pried from the bamboo steamer. The score? A 2-2 draw. It wasn’t until it came to the bag chomp and slurp that I found my winner. Din Tai Fung’s XLB has a lovely broth, but unlike HuTong, there is still a hint of the gelatine in the soup. HuTong’s by comparison has a cleaner broth. So at my table, my scorecard read DTF 2, HuTong 3. Melbourne wins this one – at least until I hit Shanghai Tang in Sydney’s Chinatown and comb Ashfield for more contenders. And, well, living in Surry Hills means that Din Tai Fung is geographically desirable, and with terrific XLB just shy of HuTong’s greatness, it’ll still feature nicely among my roster of local Asian favourites like Spice I Am, Mamak and Pasteur. And there was another highlight at Din Tai Fung: my virgin taste of dan dan noodles, which I have become intimately familiar with after reading Fuchsia Dunlop’s food tome on China, Shark’s Fin and Sichuan Pepper. I was mostly full when I noticed them on the menu, reading it in detail to occupy myself between my deliveries of bamboo baskets. Excited by my find, I ordered the spicy version – this being a Sichuan speciality, how could I not? The thin wheat noodles arrived sprinkled with sesame seeds and sliced green onion (“shallots” for those still clinging to Australia’s confused naming regime) and in a lovely thin brown sauce. Somehow despite reading that peanuts are a key ingredient, I glossed over that fact. So, admittedly, there was more texture in the sauce than I expected, but the taste was terrific and comforting – like meeting an overseas penpal after writing to one other for ten years. My only gripe was that it lacked any true heat; I walked away from the bowl with nary a sniffle or moistened cheek. My guess is that this was a mellowed Taiwanese idea of spice (DTF is Shanghainese in origin, but based in Taiwan), so I’ll have to wait until I lead my food tour through China in April to taste the real thing in Chengdu. I’m counting the days already. 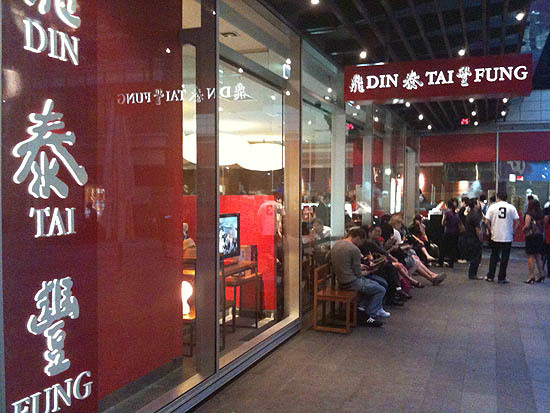 Din Tai Fung, World Square, 644 George St, Sydney, (02) 9264 6010.